iSpy can connect to virtually any video source. 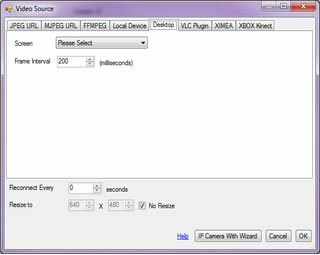 To add a camera into iSpy click on "Add" and click "Local Camera" to add a USB camera, "IP Camera" to add a network camera, or "VLC Camera Source" to use the VLC plugin. You will be taken to one of the following screens to configure the connection. At this point you can change the tab selection if you change your mind about the type of camera you want to add. Alternatively you can right click on the iSpy Surface background and click "Add Camera" from there. USB cameras must be connected to your computer to be able to add them in to iSpy. The device will appear in the drop down so adding it into iSpy is as simple as selecting it and clicking OK. Note that if the camera is in use by another application at the time iSpy will not be able to access it. We've written a free virtual webcam driver which enables you to use any camera you have added to ispy in applications like skype, messenger etc. Use USB cameras from different manufacturers - for example you could use 3 USB cameras simultaneously if you use one from Microsoft, one from Logitech and one from Targus. Add your duplicate cameras to other computers and install iSpyServer on those computers and access them from iSpy as a JPEG feed. Copy this address down and come back to your computer running iSpy. 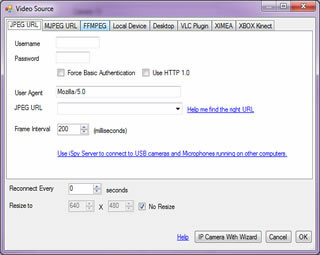 Add a JPEG camera (as shown) and paste the address into the JPEG URL field. 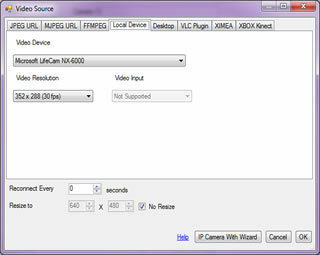 Click OK. You should now be able to access your remote USB camera feed over the network. 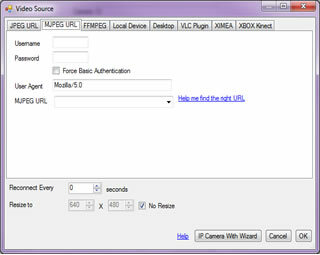 Use an MJPEG or JPEG source to connect to webcams and most IP cameras. The URLs for IP cameras vary a lot. We've added a wizard to the iSpyConnect website which guides you through finding the right URL for your camera. If you can't get it to work, see our guide for Finding Camera URLs with Fiddler/ WireShark. Many IP cameras publish both audio and video feeds in other stream formats - like MP4 or ASF or RTSP. iSpy can connect to all these using the VLC plugin. To use VLC you will need to download and install it, then restart iSpy and select VLC when adding a camera. The URL to connect to your camera feeds should be available in the manual that came with your camera or on request from the manufacturer. Reconnect Every: Some sources will only stream for a set amount of time. Enter a value here to force VLC to reconnect to the camera on an interval (recording won't be affected) - or enter 0 to disable (default). iSpy includes the ability to monitor and record the windows desktop. As most desktops are high resolution we've added in the ability to resize the recording to minimise processor and file sizes. You can treat the windows desktop camera type just like a normal camera - for example you can do motion detection on it (so you get an alert if anyone starts using the computer) or you can watch a live feed remotely to see what people are doing on it (and what they have been doing on it). iSpy also supports multi display setups and you can choose a screen to monitor. XIMEA cameras have an embedded windows operating system in them - and so can run iSpy without the need of a separate computer. Find out more about XIMEA here. iSpy can connect to Kinect cameras. Note that the Kinect device needs to be plugged into your computer - it cannot be accessed over the network on your Xbox 360. Watch the traffic in fiddler - it'll show you every request going in and out. When you see something that looks like a video feed (in this case it's /videostream.cgi) click on File and untick "Capture Traffic". Use this URL in iSpy as either a JPEG feed, an MJPEG feed or a VLC feed (depending on the extension). In this case i'd add a new MJPEG type, put my username and password into the fields and use http://192.168.1.6/videostream.cgi as the URL. Important: remember to close Fiddler down before trying to connect. Fiddler includes a proxy server that can sometimes interrupt the network connection from iSpy.